I do not own a flash. It is one of the items on my wishlist for this year and I do intend to get one sooner or later. For the moment though, when I need to use one, I need to borrow it. Thankfully, my boss is also a fan of photography, and has one on hand that she has lent to me before (for the last wedding that I had to shoot). With another wedding around the corner, I needed to borrow it again and needed to get used to using it again. The flash in question is a very very nice one, but the exact specifications are not actually all that important for this blog. What is important to know is that the flash fits into the hotshoe of the camera and has the ability to tilt upwards by 90 degrees and 45 degrees to either side. It is something that I absolutely love about the flash and something that I am definitely going to try to find in whichever flash I end up buying. Why is this so important then? First of all, having a flash that fits into your hotshoe is very useful when doing photo shoots outside of a studio. When you are in a studio, you can arrange the lighting in any way that you like through the use of umbrellas, reflectors and more powerful lights than a flash can provide. When you are out and shooting, however, you do not always have these available to you. The on-camera flash is too harsh for most situations and, since you cannot adjust where it points, it often ends up only illuminating what is in front of you and not providing sufficient ambient light. This can, of course, be made up for by adjusting the shutter speed and exposure, but when the images are being taken with a hand-held camera rather than a tripod, it can be difficult to perfect. This is why having a flash that fits onto your hotshoe can be useful. Of course, being able to use it off-camera (which this one can do) would also be useful, I imagine, but I have yet to experiment with that, and for the moment will only be talking about using it on a hotshoe. Having a stronger flash on your hotshoe, which can be adjusted in terms of brightness, can have diffusers attached to it and can tilt gives you a lot more flexibility in the images that you can take and make. The tilt is the other big advantage to having a hotshoe flash. This flexibility is less important when using a flash off-camera, since you can point the flash in any direction that you choose. But, when the flash is attached to your camera, you cannot point the flash in a different direction to the one that the camera is facing unless it has a tilt function. And the tilt function makes a huge difference. By tilting the flash, you can bounce the light that the flash provides to illuminate your subject in the best possible way. I have taken some images to illustrate the point. In the above image, the first two shots were taken with the flash, a shutter speed of 1/50, an aperture of f/8 and had an ISO of 400. The final image was taken without flash. It was taken with a shutter speed of 1/25, a fairly low one and good for handheld photography, the lowest aperture that my lens would allow for (f/4.5) and an ISO of 3200. All shots are directly from the camera and have not been edited except to put them together in this "collage". 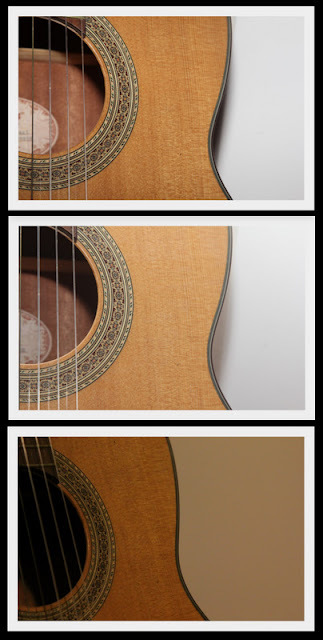 The first image was taken with the flash pointing directly at the guitar. 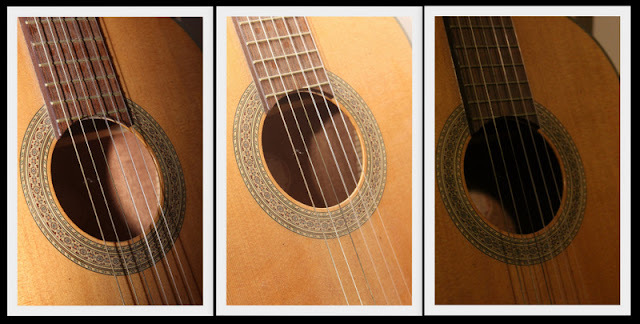 You will notice that the shadows in the centre are dark, the light in the centre is very stark compared to the shadows, the light reflecting off the string and the left side of the guitar is very bright, and you can see the shadows underneath the strings because of the angle that the photo was taken at. If you look to the upper right corner, you will also notice that it is completely in shadow. In the second image, I had tilted the flash 45 degrees to the left. You will notice that the shadows in the centre are a lot more muted. There are still shadows, but they are less obtrusive and the light in the centre is less bright and less stark because of it. The strings are brighter, but not as reflective and there are no longer any shadows underneath them. The light itself is better distributed throughout the image and if you look at the upper right hand corner of this image, you will notice that it is white (as it should be). In the third image, you will notice that the photo is not well lit in general, even at a fairly low aperture and shutter speed. However, there are noticable details. The colouring is a lot yellower in the image and the shadows are also distinct, especially when compared to the second image. There are no stark contrasts, however, and everything is fairly muted. The third image clearly needs more or better lighting, which the flash provided in both of the photos to the left of it. The second image might be a little too well lit. Shadows do provide interest to images, and there are hardly any in this image. Adding a little contrast would take it a long way. The first image is better in terms of the interest that the shadows provide, but may be a bit too stark and is far from ideal for most situations. I would likely end up brightening it to some extent in post-editing. The same can be seen in the next images. None of these are perfect photos, none of them were meant to be perfect. But they do show the usefulness of tilting your flash and bouncing light on a subject. It can have great results if you know how to use it, and it is something that I am still learning how to use. But I can already see a big difference in the photographs that have been taken while I used it. It is something that I look forward to learning more about! What area of photography do you want to learn more about?